Built By Broom boats using Hand laid heavy laminates and white gelcoats, and Mahogany Based interior timberwork. Engines Volvo TAMD 42's 6 Cylinder turbo six cylinders with reduction gearboxes, and driving down straight shafts to four bladed Bronze propellers. These robust units have run around 2800 Hours .from new. Tanks Fuel tanks (S/S) outside each engine of 125 Gallons each (568lts,) 250 Gallons total (1136lts) fresh water 110 Gallons (500lts) aft under berth. waste holding tank (approx 30 Gallons) s/s forward under floor, with "Y" Diverter valves and deck as well as underwater discharge Berths 6 berths, Great double cabin aft, twin single adult berths forward, and a double conversion to port dinette area. chain locker has a weighted curtain to protect from wet chain..
Nice simple heads ( vacuflush) note Y Lever behind toilet to right, "To Sea / To Tank"
Tv and stereo hiden away..
BROOM .... Island aft berth, always good. forward cabin bulkhead has engine access locker. TEAK to deck, note big lockers under seating..
decent drop in side ladder, and note strap hinge right of shot, as arch folds down. side gates each side, Moulded step in hull each side also. Makes her air draught low enough to get to some of the prettier bits of smaller French canals I am told. Hose/Elbow Clamp joints to potentially leak inside the boat, simple but effective. and the "fishtail" exit point mimics the usual external pods as well. 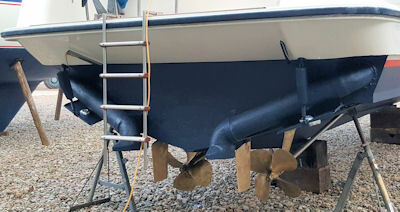 note trim tabs about to be cleaned and have new anodes fitted. Electronics Ray marine 2 KW ray dome to colour 7" Screen ( SL70 RC)( 2003) and GPS plotter, with Raymarine 6002 ST Autopilot, ( 2003) Shipmate RS 8300 VHF radio with remote external speaker, , Trim tabs Small Flat screen Tv and stereo unit , ST 50 log echosounder. Extras Bow thruster fitted, Stainless screens and windows option. 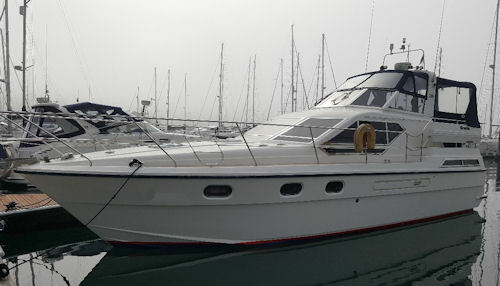 ( expensive as they are solid stainless not just covers..), Waste holding tank with under water and deck discharge, Drop down front screens, recent teak deck forward replacement. Yamaha 260 STi inflatable dinghy, and a Tohatsu 2.5 Outboard motor , Drop in s/s side boarding ladder, refurbished carpetrs, curtains, upholsteries,, few years back but still looking good. Eberspacher diesel fired central heating, warps, fenders, etc etc usual kit, Life belt, ensign staff etc. History Bought through Boat showrooms ( Broom dealers at the time, By This her second owners from new. ! 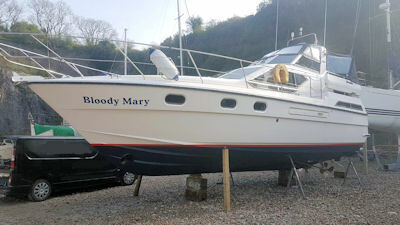 and used mostly from Brixham on the south coast, she had a Boay safety Certificate survey in 2007, was last lifted for Anodes, antifoul etc in May 2018, and hade her engines serviced in December 17 and April 2018.. There is no finance on the boat.